Immigration reform is a hot button issue being debated across America, from the floor of the Capitol to main street U.S.A. There are currently an estimated 11.5 million illegal immigrants living in the U.S., that's a 33% increase since 2000. And in fact, today 5.2% of the U.S. labor force consists of undocumented workers. The “Gang of Eight,” a bipartisan group of eight senators, is currently working on a plan to reform immigration policy in the U.S. The group of lawmakers is expected to present its bill, which will provide a path to U.S. citizenship for all those living in this country illegally, on the floor of the Senate later in March. The senators have a difficult task. They must consider how legalizing over 10 million immigrants might affect jobs, border security and tax revenue. Another issue they must consider is that if passed, immigration reform could also impact Social Security taxes and checks. Stephen Goss, chief actuary of the Social Security Administration estimates that 3.1 million illegal workers pay into Social Security each year. In 2010, undocumented workers and their employers paid $15 billion to Social Security with no intention of ever collecting benefits -- that year illegal workers only received $1 billion back. How do working illegal immigrants pay in to and collect Social Security? Some are issued Social Security numbers with their temporary or student visas, others forge documents and were issued numbers by Social Security before they tightened their screening process in 2001, some steal numbers, and others simply make them up. When workers pay Social Security under numbers that don’t match their names the administration sorts these into their “suspense” file. No one gets credit towards benefits for this money but the money does still go to the Social Security trust fund. 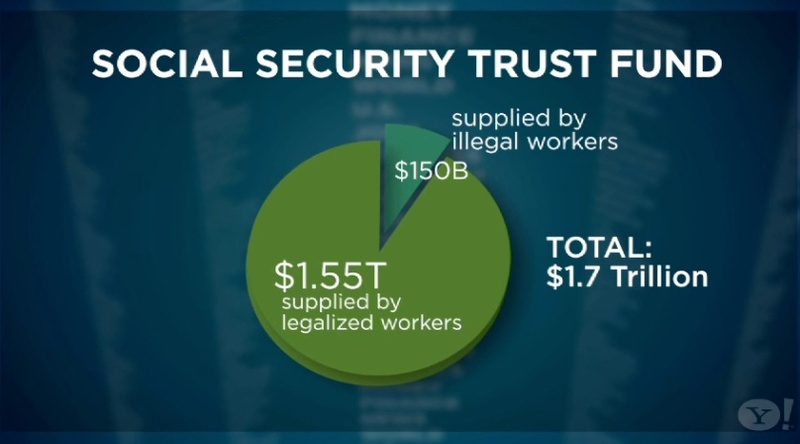 Over the course of many years, Goss estimates that a total of $150 billion in undocumented workers' money has flowed into the Social Security trust fund. That’s about 8% of the total $1.7 trillion Social Security has in reserve. In 2010 Goss said if not for the millions of illegal workers paying into the system Social Security would have “entered persistent shortfall of tax revenue to cover payouts starting in 2009." He tells The Daily Ticker today that things may have to change. “It might mean that we might have to have a higher tax rate or lower benefits,” he says. While some argue legalizing millions of illegal immigrants will help keep Social Security solvent, Mark Krikorian, executive director of the Center for Immigration Studies disagrees. “If they’re legalized then they can collect Social Security and guess what? People with low incomes get more out of Social Security, generally speaking, than they pay in," he argues. "So the Social Security argument is actually an argument for keeping illegal immigrants illegal because that way they won’t ever collect Social Security." It’s true that undocumented workers typically earn lower wages. 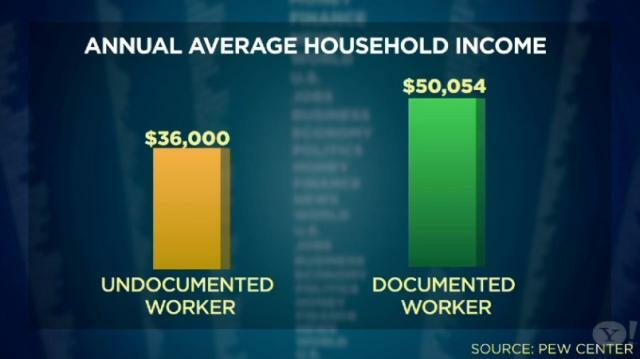 The average illegal immigrant run household makes about $17,000 less a year than its legal counterpart. Edward Alden of the Council on Foreign Relations says that granting amnesty would actually lead to higher wages and allow immigrants to pay more towards Social Security. "You have people who are often working in very low wage jobs because they’re uncertain about their status they’re scared," Aldin tells The Daily Ticker. "So these people generally, the analysis shows their wages will go up, they’re going to pay more into the Social Security system. The CBO has run these numbers, in the short-run there’s a big boost for the Social Security system." In 2007 the Congressional Budget Office projected that granting amnesty to illegal immigrants would actually boost Social Security funds $57 billion by 2017. Steven Goss of the Social Security Administration also claims that amnesty would more than double the numbers of those paying into social security and depending on legislation might benefit the fund. Will immigration reform take a chunk of change out of your Social Security check? Do you think immigration reform helps or hurts Social Security? Let us know in the comments below!